The University of Maryland’s A. James Clark School of Engineering has been ranked No. 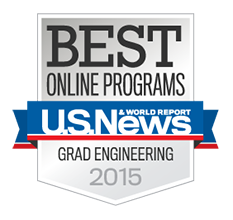 13 of the 2015 Best Online Engineering Programs rankings, released today by U.S. News and World Report. The Clark School’s online engineering programs were ranked No. 14 in 2014. Designed for working engineers and technical professionals, the Master of Engineering and Graduate Certificate in Engineering online programs offer focuses in eight academic disciplines: Bioengineering, Cybersecurity, Energetic Concepts, Fire Protection, Nuclear, Project Management, Reliability, and Sustainable Energy. The Clark School applies the same admission requirements and education outcomes to online learning as on-campus learning. Online classes allow students worldwide to access lecture material at their convenience and benefit from the knowledge and expertise of the faculty from the Clark School. The Clark School's advanced distance learning technologies and the Seigel Learning Center have been recognized and featured in national publications, including Nature. According to U.S. News and World Report, the annual Best Online Engineering Program ranking is determined based on data from the following categories: admissions selectivity, faculty credentials and training, student engagement, student services and technology, and peer reputation.